One of the biggest challenges when updating a home is visualising how new furniture will look in your space. That’s why we’ve transformed an area in our Tottenham Court Road store into our own Heal’s apartment, furnished head to toe with designs from our bestselling Brunel collection. The immersive space is now open for you to explore and is guaranteed to give you plenty of styling inspiration for your own home. 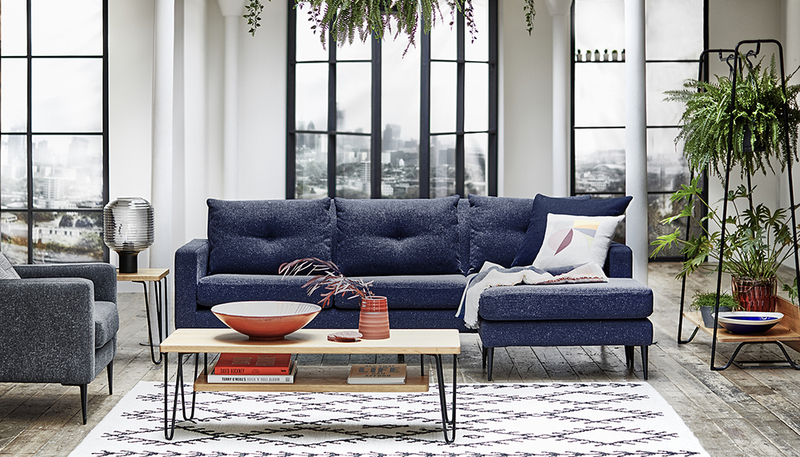 Our Brunel collection was designed with modern living in mind. City dwellers are increasingly having to squeeze furniture into homes where space is at a premium. Brunel’s multifunctional, compact designs create the illusion of space and help to utilise the room you do have more effectively. The Brunel Lean Mirror, for example, has hidden hanging and storage space behind it while the Brunel sofa and armchair manage to provide ample seating while only utilising a small footprint. We commissioned stylist Diana Civil to transform the space into a cosy, modern apartment. She presented us with a number of inspirational images and illustrations that showcased her vision – earthy tones and large leafy plants offset the light oak our Brunel furniture. The immersive space features a living room, bedroom, study, bathroom and kitchen to provide you with inspiration for every corner of your home. If you’re stuck for ideas for your home, explore our Home Inspiration section which features ideas for every size, style and budget. You can also explore our most popular collections. As chosen by Heal’s customers, these collections feature some of the world’s most famous design icons as well as pieces created by the very best British design talent. This entry was posted in Happening At Heal's. Bookmark the permalink.